No sales associate waits patiently to answer questions. Exhibits don't have catalogs. Hours are irregular. But those who enter 27 Sears Lane in Burlington's South End will have no doubt they've walked into a gallery. The walls are white, the ceiling is high and the space is creatively partitioned by a curving wall. Plus, the eye-catching, contemporary art is a dead giveaway. 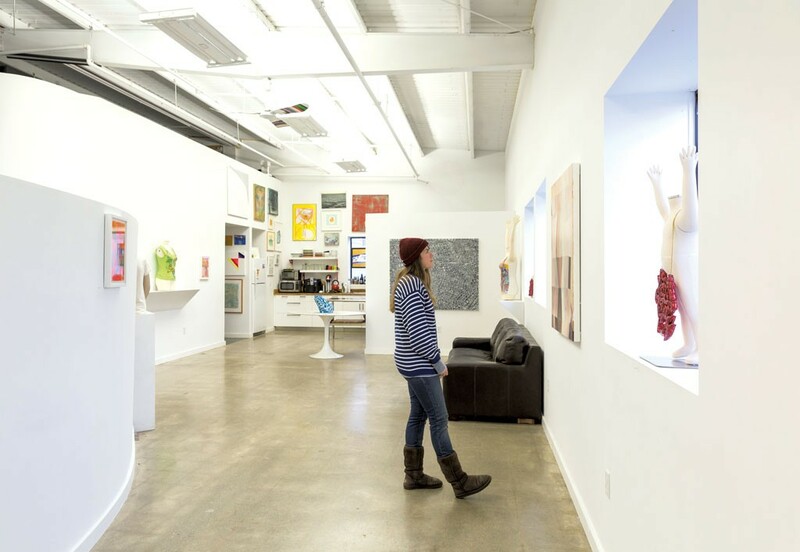 Launched in September by Burlington artists Clark Derbes and Wylie Sofia Garcia, South Gallery is the latest addition to the Queen City's arts scene. Tucked into the front of RLPhoto, a studio owned by photographer Rick Levinson, South Gallery is a for-profit endeavor designed to fill a market niche for the area. It displays artwork that Derbes suggests might be considered "demanding" or "experimental" by the average local art enthusiast. "I wanted to show work that's a little more challenging and exciting, and not cater to making sales," Derbes says. "We didn't want to say, 'We're not going to show that because I don't think we can sell it.'" That luxury comes with the turf: Derbes' studio is in the back, and his and Levinson's rents cover the gallery's. "The space is here, and we have nothing to lose," says Derbes. "We only have something to gain. We just went at it with that attitude: Whatever sales happen, and whatever connections are made between artists and collectors, it's all in the black from the get-go." 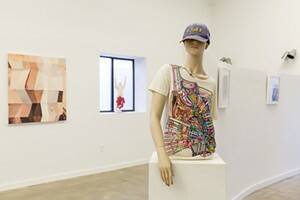 South Gallery's current show, "The Body Electric" (tagline: "Sensual. Visceral. Biological. Electric. "), certainly shows off some nontraditional art. In addition to two-dimensional works by Steve Budington, Scott Dolan and Tara Jensen, the exhibit includes glittering, red, soft-sculpture necklaces by Hiroka Nakahira; and T-shirts by Eric Eickmann, hand-painted with neon geometrical abstractions. This is South Gallery's third show — Derbes and Garcia opened with works by more than 30 artists, and followed that with another group show for the South End Art Hop. A "small works" show will be hung at the end of November. "There was a lot of energy during that first opening," Derbes recalls. "There were hundreds of people in here, and everybody was really psyched about it." It was also the first time the space had been used for showing art since Derbes and Levinson hosted Burlington's monthly "Creative Competitions" there. They passed that torch to Christy Mitchell at S.P.A.C.E. Gallery last year. Currently, South Gallery represents 30-some artists working in a variety of mediums and with a range of professional experience. Established local artists include Pamela Fraser, Catherine Hall, Peter Fried and W. David Powell. Some of the gallery's emerging artists had not previously been publicly exhibited. The range of artwork is diverse — and, yes, some of it is "challenging." How do the gallerists choose? Derbes acknowledges that personal taste plays a strong role. He and Garcia, who are husband and wife, had an "ongoing discussion" about opening a gallery. "We had been compiling ... a list for, like, five years," Derbes says. Though he's enjoyed soliciting work from artists and curating shows, Derbes admits he did not relish stepping into an art dealer role. "[Saying no] is a really hard thing to do, especially being an artist, and especially coming from doing Creative Comp, which was the opposite of curating," he says. A look around the gallery suggests some of that inclusive spirit remains. In lieu of storage racks or closets, the walls of the building's kitchenette are covered with inventory, salon-style. The pleasantly cluttered space gives an instant sense of South Gallery's eclectic stable of artists. Mark Waskow, an avid local collector and board president of the South End Arts and Business Association, points out that having a competitive, for-profit contemporary arts gallery is an important step for the arts community. "What attracts me to South Gallery is that its sole purpose is to expose and promote artists' work," he says. "I am a big fan of shows in areas like coffee shops, hotels and libraries. But it's nice to have shows in places that exist solely to show the art." Catherine Hall, a longtime South End artist, concurs that South Gallery has, thus far, contributed to "a niche that needs to be filled." "Some of [the work] has been quite challenging and sort of broken boundaries," she says. "It's nice to see a really broad definition of what art can be today." In a town that's had a history of galleries opening and closing, "time will tell" what will become of South Gallery, Hall says. Right now, the gallery is breaking even financially, Derbes reveals. For him and Garcia, who recently had their second child and juggle their own art-career commitments, the goal is simply to "show the work" and "make connections." "Just to bring people together, even if it's only once every month, was important to us," he adds. "In Vermont, people are hunkered down. You really have to get a crowbar to get people together." The original print version of this article was headlined "All in the Mix"